After spending months in limbo, waiting for the state to hash out rules for testing medical marijuana, laboratories might be able to get to work soon. That moves patients one step closer to the first legal sales in dispensaries. A state health official said Tuesday that all the rules are in place for labs to start testing marijuana. 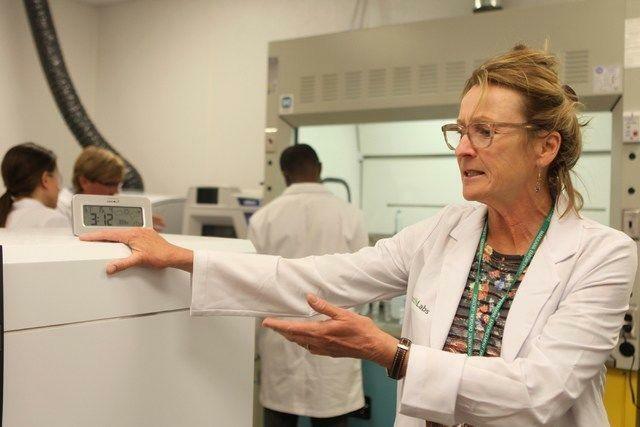 But in a sign of how confusing the process has been, that news came as a surprise to a dispensary owner and a lab scientist, who both expected a longer wait for the state to finalize some rules. Euphoria Wellness, a dispensary near Las Vegas, has 371 patients preregistered and received its state license weeks ago — the first dispensary in the state to do so. But it can’t sell any marijuana until it’s tested by a state-licensed lab. “I have people coming to my door every day saying, ‘How come you’re not open?’ ” co-owner Joe Lamarca said Tuesday. Businesses have been spending money on rent, startup costs and workers — money they can’t begin to recoup until they open. Lamarca said he and his partners had to hire and train employees before the dispensary could get its state license. “Now I’ve trained them, I’m paying them, and I still can’t open,” he said. As of Tuesday afternoon, no one had been able to tell him when he could start selling marijuana. But Steve Gilbert, a state medical marijuana program manager, said dispensaries can start selling as soon as the plants are tested. It was unclear when patients will be able to buy marijuana. Part of the delay in crafting testing rules has been due to the work of an outside group, the Independent Laboratory Advisory Committee, tasked with recommending to the state limits for pesticides, heavy metals and other substances. Committee members and state officials have disagreed both publicly and privately, largely about pesticides. And the process has been agonizingly slow. “They’ve only wanted to deal with one subject matter at a time,” Orser said. The committee has met four times, with a fifth scheduled today. In early meetings, members and state staffers struggled to figure out how to conduct the meetings. Not until the fourth meeting, on April 16, did the committee vote on recommended pesticide rules, which led to a formal state policy issued Monday. Even after that vote, there was confusion about how exactly testing will work. In internal emails provided to the Review-Journal, committee members said they worry the state’s policy — which includes very low detection limits for pesticides — will make conducting lab tests too expensive. That could in turn drive up costs to patients, perhaps forcing people to the black market. Gilbert said the state understands the concerns but that its hands are tied by state law and regulations. Pesticide limits could be relaxed eventually. Officials have said some of the overly strict rules are due to a poorly worded regulation that can’t be changed until later this year. There were 8,925 marijuana patient cardholders in Nevada as of April, 6,420 of them — or 72 percent — in Clark County. Another 594 people statewide had caregiver cards that allow them to administer marijuana to another person. State officials and people in the industry have said they think the marijuana sold in Nevada will be safer than in other states, where regulations are inconsistent or nonexistent. But with the delays, Lamarca said, the state has let the perfect be the enemy of the good, with patients suffering the consequences. Unless people are growing marijuana themselves, which is relatively rare, they’ve had to go without — or buy it illegally. “They’re now forcing people to continue to go to the open marketplace, where nothing is tested,” Lamarca said.